By mid-August, we had a lot of dragonflies on the property. I’ve been attracted to dragonflies for a few years, and I loved seeing them flying around outside my bedroom window this summer. One day I was scrolling through Pinterest and saw a macrame piece that at first glance resembled a dragonfly, but upon closer inspection I realized it wasn’t. 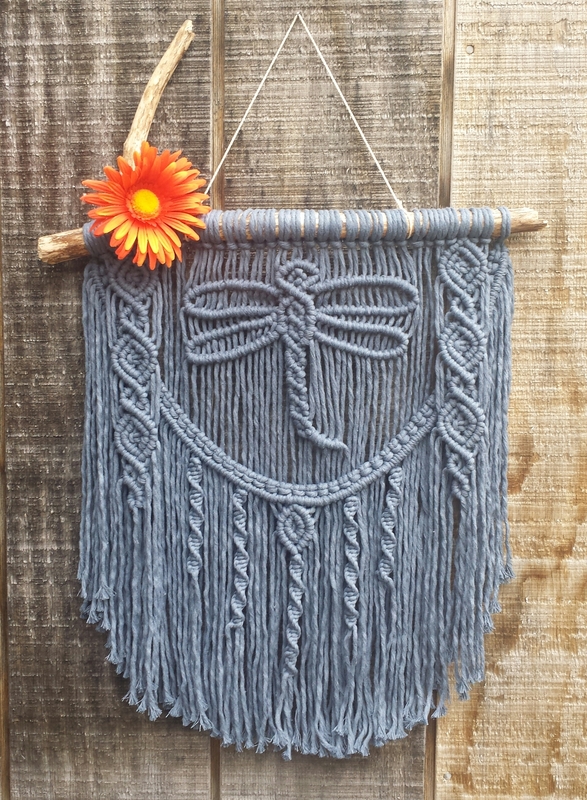 So I wondered how I could create a dragonfly macramé design myself. I did up a little sketch trying to figure it out, but I had other projects that seemed more important and I figured I wouldn’t get around to trying it anytime soon. Well, my day went downhill and I ended up in tears, just sobbing. I laid on my bed crying and looked out the window and saw all the dragonflies flying around, and for some reason it seemed to make me feel just a little bit better. After sobbing some more and swapping the laundry, I decided, To hell with plans, I’m going to make a dragonfly macrame right now, even though I will probably mess it up really badly. I started looking through my driftwood pile and then thought I should use one of the sticks I pulled out of the yard the week before while trying to outrun the lightning (that’s a long story in itself that I may or may not share in the future). I was even so bold as to use my fancy new (expensive!) macramé rope on this experiment. I kept repeating to myself over and over again, “Life is risk“. A curious mood overtook me. I decided to dress up for this creative occassion. I grabbed a green dress my friend gave me because it seemed sorta nature-y princess-y. It’s like I wanted to feel like a dragonfly or fairy or something similar, trying to really embody the essence of what I was trying to create. I also put on my wood piece necklace and for some reason decided to put on my grandmother Lucille’s ring that I hadn’t worn in ages. To top it all off, I remembered the fairy wings I had just bought for the kids, and one of them was a yellow green color that perfectly matched the dress. I put them on and my transformation was complete. No one was around to take my picture so I had to settle for a lame Instagram selfie. 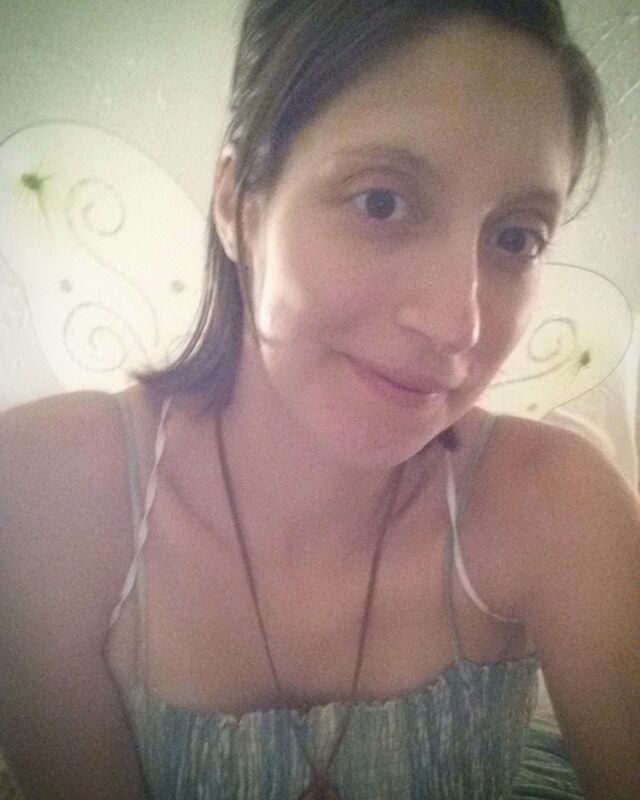 So there I was, dressed up like a fairy while working on my macrame dragonfly. My depressed mood was instantly lifted, and I felt light and purposed. It took 3 straight hours of trial and error, but I eventually managed to create a dragonfly motif and I was quite pleased it turned out as well as it did. It’s far from perfect, but considering I made the thing from complete scratch with no pattern, it’s fairly impressive. My greatest takeaway from dragonfly symbolism is that of transcending the emotions, and that’s exactly what working up this macramé was able to do for me. Dragonflies lay their eggs in the water, and that is where they begin life (not so unlike humans in the waters of the womb). Dragonflies eventually grow into winged insects, transcending their watery nursery and flying high above it all. Water often represents emotions. I was a pathetic emotional mess, searching for a way out, and when I saw the dragonflies, I felt so inspired that I was able to transcend my emotional crisis through the creative process. It took me a couple more days to finish the piece. The fringe part represents the waters of the womb, and the spirals represent DNA. The one little round shaped pattern represents the egg of the dragonfly, which transforms into the dragonfly motif which itself rises above it. The two panels on the side I later named Serenity, and began making entire macramé pieces of that pattern. I think the concept of serenity really does surpass emotions, being a place of spiritual security and fullness. I later made a smaller dragonfly piece with my favorite teal yarn (and had a heck of a time trying to remember how I constructed the first pattern!) and attached a sunstone to it. The sunstone really seemed to complete the piece, as did the orange daisy for the first one. I love adding extra details to my macrame to give a more complete feeling. So many times during emotional stress I have looked up to see my dragonfly macramé pieces and am able to find the courage and strength to pull myself together and get back to living. Other times, the sight of my dragonflies simply comfort me with the fact that although I may be drowning in the waters of reckless emotion with no immediate escape, this too shall pass as it always does, and I will find my wings yet again. I am learning to flow with the rhythm of the circle of life. 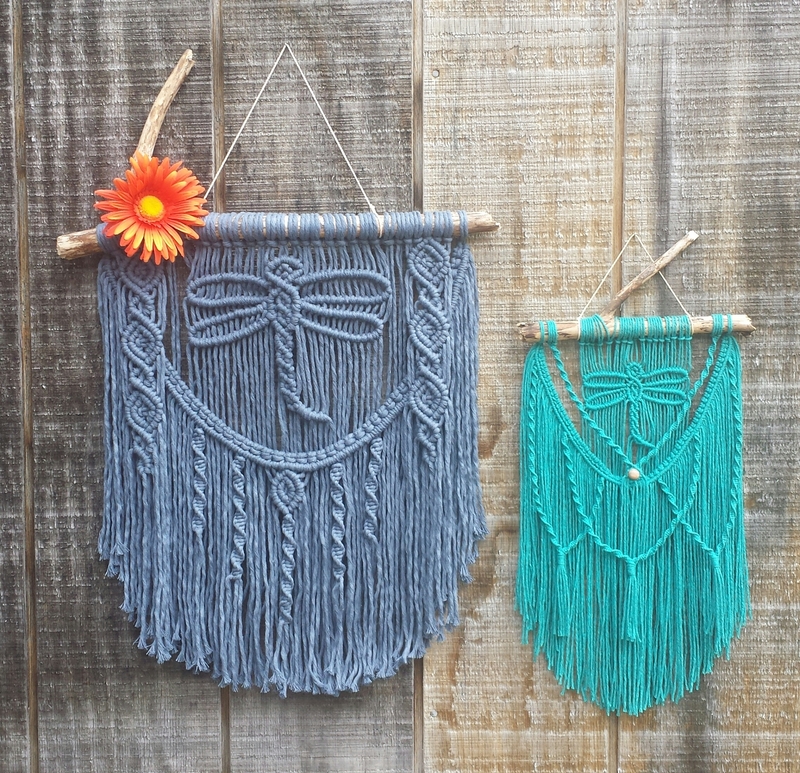 If you are interested in your own custom dragonfly macramé wall hanging, email me at thegracefulbirch@gmail.com. I am also planning to have other dragonfly styles available in the near future, so stay tuned! They came out beautiful! Isn’t it great how working with your hands helps in times of trouble!